Grenville began his career as a teacher before moving into the charity sector and the National Parks. He has spent the last decade developing small-scale renewable energy projects across Wales and is an expert on sustainability and energy issues. He is the founder of several social enterprises which have picked up numerous innovation prizes including an Ashden Award for Community Energy, the £1 million Big Green Challenge from NESTA and the Powys Small Business of the Year. Grenville was recognised in the New Years Honours list for his services to the renewable energy industry in Wales and is a Fellow of the Royal Society of the Arts. He is also a former leader of the Wales Green Party. 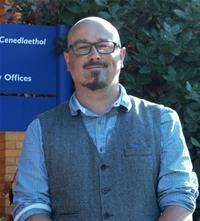 He is a Brecon Town Councillor, a Mount Street Juniors School Governor and community activist. He lives in Brecon with his wife and children.